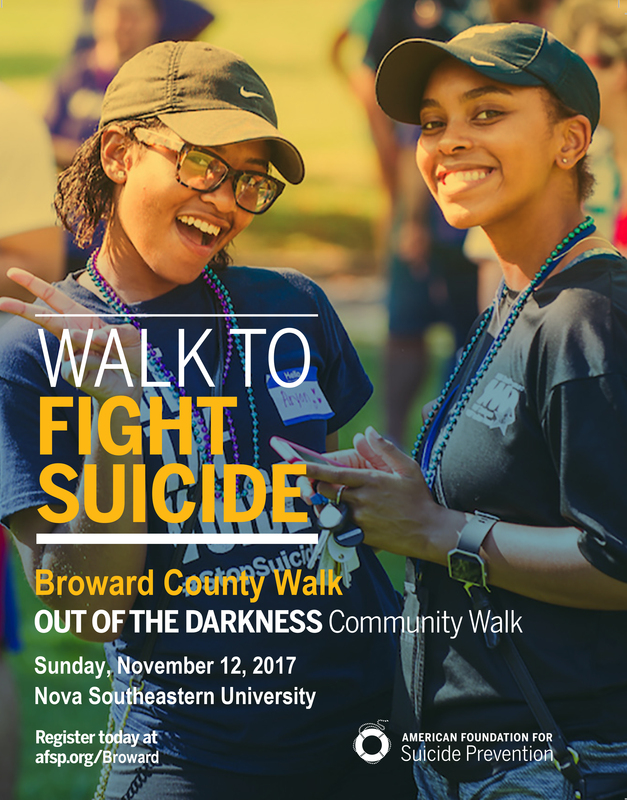 Join the NSU and South Florida community in raising suicide awareness through participating in the annual Broward County Out of the Darkness Community Walk on Sunday, November 12 on the NSU main campus. The walk is co-sponsored by the American Foundation for Suicide Awareness and the Gamma Delta Chapter of Lambda Theta Alpha Latin Sorority, Inc.
5K starts at 9:00 a.m. The walk will begin and end at Fellows Way, the area between the Carl DeSantis Building and the Rose and Alfred Miniaci Performing Arts Center. Participants will also be given and encouraged to wear colored beads in honor of loved ones lost to suicide. All donations will go towards the American Foundation for Suicide Awareness. To register, donate and stay updated on donations raised, visit https://afsp.donordrive.com/index.cfm?fuseaction=donordrive.event&eventID=4778. For additional information, call Michelle Manley, Director of Student Media, at (954) 262-7482.